Narimichi Kawabata made his sensational debut as a violinist after graduating first on the list of Royal Academy of Music and conferred Special Artist Status as the second person ever in the academy’s long history of nearly 200 years. Becoming one of the most desired soloists in Japan to perform regularly at top-class venues such as Suntory Hall, Kawabata dedicates significant amount of his time in charity, potentially driven by his childhood experience of the medical accident, which left him visually impaired. He is currently based in the U.K. performing as an international soloist across the world. Narimichi became visually impaired at the age of eight and has been studying with his ears alone. He is now based in UK as an international soloist, while taking part in many charity concerts in and out of Japan. He has been supporting various good causes including charity concerts for West African refugees and for the international Red Cross. He has drawn national attention ever since his debut album “On Wings of Song” became a record breaking hit in 1999. In 1998, Narimichi made his debut in Japan to a critical acclaim, performing with the Japan Philharmonic Orchestra at Suntory Hall in Tokyo. Since then, he has been appearing on international stages including London’s Wigmore Hall and Carnegie Hall in New York, with strong appraisal from the local media. 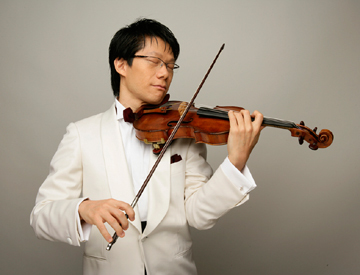 Narimichi has also performed with major orchestras such as St. Petersburg Camerata and Moscow Philharmony Orchestra amidst his numerous recital schedules. Narimichi’s first CD “On Wings of Song” sold an unprecedented 200 thousand copies as a classical album, and the following CD “Ave Maria” also achieved No.1 position in the classical chart. Many of Narimichi’s performances are often sold out, and his concert attendances reach up to 100 thousand people every year. After his concerts, long queues of people asking for his CDs and books can be seen at the autograph session, which must be said as an unusual phenomena for a classical music concert. Future plans for concerts include a Japan Tour with Mozarteum Orchestra of Salzburg conducted by Hubert Soudant and a national recital tour for 2006. The following is an excerpt from his autobiography book, I cried with eyes that have no tears.